In 2012, a team at the Belfer Center for Innovation & Social Impact at the 92nd Street Y in New York City came up with the idea to set aside a day for generosity during a season otherwise overthrown by consumption. Once the hashtag #GivingTuesday caught on, it spread like wildfire. Now, seven years later, Giving Tuesday has become recognized as a global movement. Participating in a day dedicated to giving back seems only right after celebrating a holiday where you eat non-stop then shop for four straight days, am I right? According to GivingTuesday.org, the movement allows organizations across the world to take advantage of social media by providing a platform to encourage the donation of time, resources and talents to address local challenges. It brings together the collective power of partners—nonprofits, civic organizations, businesses and corporations—to encourage and amplify small acts of kindness. 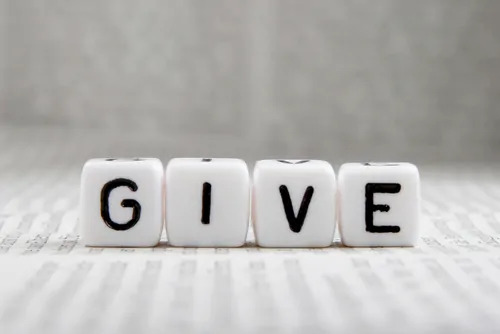 Last year, Giving Tuesday broke records with nearly $300 million raised from over 2.5 million contributors, which is 70 percent higher than 2016’s total. Organizations are challenging their consumers to shatter those records this year. Want to get involved? We compiled a list of 8 simple ways you can give back today. TWLOHA. During a season where many are faced with brokenness in their families or seasonal depression, that hope is needed more than ever. Adaptive Training Foundation. This organization seeks to restore hope through movement to those with traumatic injuries by offering customized training programs to redefine the best version of themselves. They focus heavily on veterans. ATF is committed to keeping their programs 100% free of charge for their applicants. World Vision. When you donate to World Vision, you’re giving families the tools to overcome poverty and injustice. Plus, when you donate today, your donation will be matched by Thirty-One Gifts, up to $2 million. “By this kind of hard work we must help the weak, remembering the words the Lord Jesus himself said: ‘It is more blessed to give than to receive.’” Acts 20:35. Preemptive Love. This year for Giving Tuesday, Preemptive Love is launching a yearlong effort to help Syrian families in Aleppo and Deir ez-Zor—two cities in Syria ripped apart by war. The organization will be planting crops, raising livestock and cultivating mushrooms to help the Syrian farms grow again and thrive on their own. Charity:water. When you donate to charity:water, you give the gift of clean drinking water to people in developing countries across the world. This year, J.Crew even launched a limited edition charity:water collection. One-hundred percent of the retail price will fund clean water. Opened your wallet to give and found only crickets? No worries. There are other ways to give. Take the time to volunteer after work. Volunteering offers the chance to give back to your community directly. Visit a homeless shelter or help organize a food pantry. Even organizing a food drive in your office could make a huge difference. You can search for non-profits in need of your time in your area here. It’s easy to spend money while you’re shopping, but sometimes it’s harder to give to charity. You can do both when you use online platforms like AmazonSmile. Every item available on Amazon is available on AmazonSmile at the exact same price, but shopping on Smile means 0.5% of your purchase goes to charity. And the best part? You choose the organization you’re giving to. You don’t have to spend your evening in a soup kitchen to make a difference today. Do something simple. Purchase the order of the person behind you at Chick-fil-A. Buy someone’s coffee. Hold the door open. Give up your seat on the train. It’s not as difficult as it seems! All in all, make today about something other than just consumption. It’s easy to get caught up in the motions of spending during the holiday season, but set aside today to make a difference in your community. Even just sharing how you’re giving back by using #GivingTuesday on social media can help spread the movement.